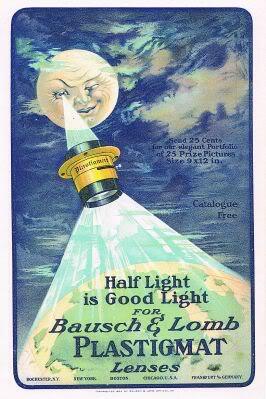 Today I have for you a 1904 ad for Bausch and Lomb Camera Lenses. I love this ad because it has a look similar to the Smashing Pumpkins Video for "Tonight, tonight" which in itself was a tribute to an early century movie about going to the moon. Bausch & Lomb was started in the 1850's and manufactured eyeglasses and microscopes. In 1903 they perfected the first poured optical glass and eliminated the need for the USA to import such glass from Germany. B&L produced microscopes, eyeglasses, binoculars and specialty optics including ragefinders for battleships. Later on they were at the forefront of sunglasses with the Ray-Ban label. Today B&L is still a powerhouse in the optics industry concentrating on contact lenses and specialty optics for the medical industry.